It seemed a unanimous consensus among participants in Horti China 2018, held November 21 to 23 in Shanghai: it's an exciting time to be involved in horticulture in China. The industry is large, growing rapidly and undergoing big upgrades in investment, technology and growing practices. A show like Horti China, which gathered fresh produce growers, horticultural technology providers and other specialists from around the world in one place, was a good place to get some insider perspectives on the evolution of the industry in China. 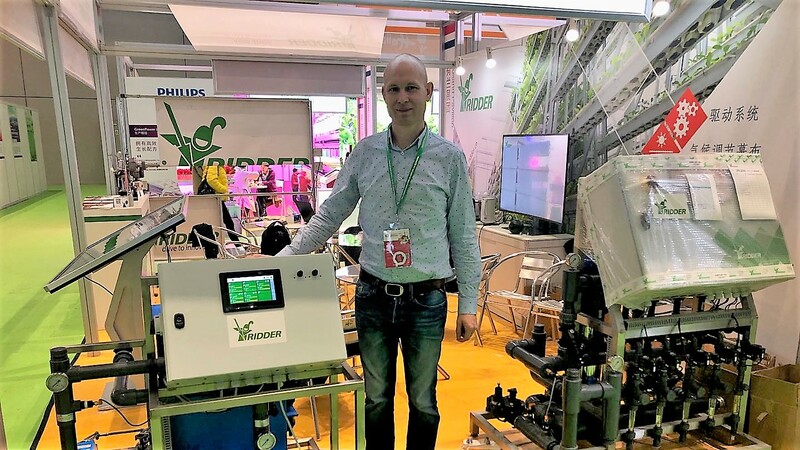 So Produce Report sat down with Fulco Wijdooge, General Manager China, for Ridder, a Netherlands-based company that provides drive systems, screens, automation, water treatment and climate management systems for modern greenhouses. Wijdooge estimates there are currently more than 1 million hectares of "solar greenhouses" in China. This is a broad term denoting the sorts of low-tech, traditional growing structures with low or no automation and soil-based cultivation that have been used for decades by household farmers in China. In the colder northern part of China, they typically consist of an earthen wall on one side to retain heat, while in the south they are more likely to be simple unraised polytunnels. "It's unsustainable in the long run," says Wijdooge of the historical status quo of low-tech greenhouses operated by small producers. Not only are freestanding greenhouses less efficient and take up more space than modern gutter-joined greenhouses, but there is also the question of who will operate small, traditional greenhouses a decade from now. According to Wijdooge, it's still very common in China for a farming family to operate only around 1/6 to 1/3 of a hectare worth of greenhouse production of vegetables, fruits or flowers. "The availability of labor is huge bottleneck for horticulture output in China," he says. And a rural workforce that is on average old and getting older, along with pressures like urbanization and competition for workers from the service sector, mean that in the long-run, Chinese farming will have to become less labor intensive, believes Wijdooge. And this is starting to happen. Ridder currently has greenhouse construction projects ranging from 10 to 26 hectares going on in different areas around China. Wijdooge says that throughout the industry, construction started picking up fast in 2016 and is still going strong with no end in sight. He also reports that new growth in modern greenhouse construction is not contained to prosperous coastal areas as it used to be. There are also large projects in remote and relatively poor provinces like Qinghai and Gansu. Some of Ridder's customers in China include end users like China National Building Materials, Haofeng, COFCO, Henan Jianye Group, Hainan Runda, Hasfarm and Ball, as well as greenhouse builders and integrators like Agri Garden, Dushi Green and Kingpeng. Modern greenhouse projects for vegetables such as tomatoes and leafy greens are seeing a lot of growth, according to Wijdooge, among many other crops starting to move from open fields into controlled environments. Other industry observers at Horti China said they expect a huge surge in berry production and consumption in China over coming years. The flower industry is also strong and seems poised for continued investment and growth in production. One factor Wijdooge identifies behind the rapid growth in modern greenhouse construction in China is that more companies from outside industries—for example, real estate developers seeking to diversify their interests—are investing in horticulture projects. Wijdooge thinks this is generally positive because access to capital allows growers to think bigger and have a longer-term vision. But he also cautions that investors from outside the industry with no horticulture experience should not insist on making final decisions about managing growing operations: "the grower should have the authority and responsibility to maintain and manage the greenhouse." Furthermore, producing in modern greenhouses is more costly than traditional solar greenhouses, says Wijdooge. So companies that want a successful return on investment need to avoid selling their products on the open market and focus on raising quality, differentiation, branding and marketing in order to achieve a higher price and capture more profit. Another risk Wijdooge sees for investing in greenhouse horticulture in China is the shortage of talented growers who understand how to operate and maintain complex and heavily automated systems. Ridder has tried to turn this into an advantage by creating simpler equipment specifically for the China market, and also by putting a large emphasis on services like software, training and after-sales service that differentiates it from competitors. This includes guiding the customer through the initial stages of getting production up- and running, ensure that there are employees at the greenhouse that understand the systems and then following up over time to make sure those systems are being properly maintained. "Our biggest worry is that we sell something and the customer doesn't end up getting any result," says Wijdooge. "We have an emphasis on how can we work together with the customer to make sure they get a return on their greenhouse investment."